Ever aware of the popular market, Bochsa based his delightfully frothy little Rondo on the marvellously witty trio 'Zitti, zitti, piano, piano' from Rossini's 'Barber of Seville', based, in its turn, on the comedy by Beaumarchais. A commedia in two acts, Rossini's opera received its first performance in Rome in 1816, and despite being hissed on that occasion, it soon gained enormous popularity. Bochsa was already living in London and may well have been present when the opera received its first London performances two years later. 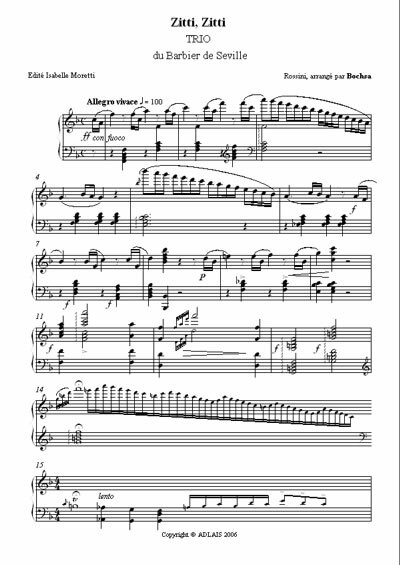 The Trio comes from Act II. It is the dead of night, and the Count and Figaro are trying to carry off Rosina, so as to ensure her escape from the clutches of her fiancé, old Dr Bartolo - ostensibly her guardian! 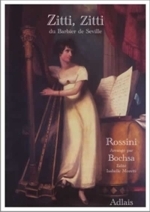 Although Bochsa is largely known to today's harp world as a composer of harp studies, he was a prolific composer, a top-ranking virtuoso, and a teacher of note. One of his many aristocratic pupils was Maria Jane Williams of Aberpergwm, whose portrait with her Erard single-action harp graces the cover of this publication. She almost certainly played 'Zitti, Zitti', but more importantly, she was the dedicatee of a major work by her teacher. Published, like the present work, in Paris, Bochsa's 'La Tempête' is dedicated to her. With her sister, Ann, she was also the dedicatee of John Thomas's 'Minstrel's Adieu to his Native Land', though this was composed thirty years later (July 1852). Maria Jane's portrait, part of a private collection and reproduced by gracious permission of the owner, is by Merthyr Tydfil-born Welsh artist Penry Williams (1802-1855) It was exhibited at the Royal Academy in 1822 (no. 565). 'Zitti, Zitti' has been edited by Isabelle Moretti, professor of harp at the Paris Conservatoire, and is published for the first time since the 1820s.